The Last Witch Hunter is a lot like a burnt steak — most people could turn quality raw materials into a tasty treat, but the chef it was given to has ruined it. Dialogue from the romance subplot stands out in a good way, and contributes a lot to viewers learning about the world of The Last Witch Hunter. Chloe is initially terrified of Kaulder, having been raised on the stories of the witch hunter who would find and punish bad witches, but finds him to be as compassionate as he is dangerous. Photos courtesy Summit Entertainment. In this case, the raw materials are solid lead actors and a great story. The movie follows Kaulder (Vin Diesel), an 800 year old witch hunter who was cursed with immortality while slaying the witch queen (Julie Englebrecht) in the Dark Ages. His handler, the 36th Dolan (Michael Caine), one of a long line, retires early in the film, but is murdered in his office soon after. Kaulder begins to hunt down the witch responsible, and after finding the newly sworn 37th Dolan (Elijah Wood) to be little help, he is thrust together with a young dream-manipulating witch, Chloe (Rose Leslie). The first thing to notice about this movie is how fundamentally bad it is. In its first scene, The Last Witch Hunter makes Fellowship of the Ring’s key mistake, opening with a long, high-fantasy prologue that’s going to be gone through again in detail later and should have been saved in full for that time. This movie would have been so much better with a cold open of Kaulder doing his thing in the 2000s, and then when he’s told to re-visit the day he was cursed, it’s a painful memory he hasn’t thought about in a long time — and neither have the viewers, because it wasn’t shoved down our throats immediately on entering the theater. Then the whole thing would have much more emotional impact as we actually learn something new about the character. Immediately after, Kaulder has a long conversation with the 36th Dolan that is one of the single most poorly written scenes of the year. Every line is so clearly meant to fill the audience in, they may as well be facing the camera instead of each other. The scene even starts with the Dolan introducing himself through narration, which is absent through the rest of the movie. This kind of half-wit dialogue and screentime priority continues through the rest of the deceptively curvy plot, with emotional reactions mostly glossed over and betrayal scenes taken in such stride that it’s impossible to feel surprised, even if you really are. Despite being an original movie, one of the few that makes it to wide release these days, as well as a movie that features a whole, colorful world of witches and enchantments, The Last Witch Hunter is a really unimaginative movie where it counts. Despite a main character who has been slaying witches for 800 years, there are only two settings — there’s one scene in the 1400s wilderness, and the rest of the film takes place over just a few days in modern New York City. That’s so boring! Kaulder talks about watching a cathedral be built over a mass grave when the city was just being established, show some of that! He’s clearly come to terms with his immortality, but was upset when he was first cursed — show some of that! As inept as the film is, it does a surprisingly good job of portraying and humanizing this invincible immortal, and it’s really tantalizing to think about how good this could be, how many far away places it could take us, in the hands of a good creative team. This is just director Breck Eisner’s third film since he debuted in 2005 with Sahara, a spectacular flop — $68.7 million domestic on a $130 million budget — and a critical failure. Between this film and 2010’s The Crazies, his biggest critical success which was definitely not that good, he’s 0 and 3 so far, and I haven’t the foggiest idea how he got this job in the first place. I’ve got a bit of discomfort with the film’s morality in this decidedly anti-nature scene. The witch queen takes Kaulder to this overgrown vision of New York City in his mind for their final fight, and it’s treated like the devil taking a character to Hell. Maybe not sacrificing a pinnacle of humanity like The Big Apple, but we could all use a little more nature in our lives. Also, it’s a bit underwhelming when, after all the psychic and magic stuff, in the final fight, the witch queen just grows out her nails and has a fist fight with him. It’s a real shame that he did, because like a burnt steak, the raw materials are still clearly high quality. Diesel has always been a decent actor, able to stuff a surprising amount of nuance into his limited range. Game of Thrones star Leslie has palpable chemistry with him. Wood turns in a bit of a dud though, as does Caine in a roll that he clearly thinks is beneath him. The visual effects are subdued but excellent as well, and it’s a little disappointing how rare they are. Advertised as an action-fantasy thriller, The Last Witch Hunter ends up as more of a mystery and a character study/romance. It would have been cool to see them work in more fighting and more chances to use visual effects within that plot. There’s some neat racial subtext and world building here, to go along with the character development. Witch heritage is genetic, and there seem to be several factions within them and even stigmas toward certain kinds of magic and talents. Kaulder is their Boogeyman, and they have a widespread cultural terror of him. There are a lot of great touches that create this effect, and it adds a lot of subtext to the subdued romance plot between Kaulder and Chloe. 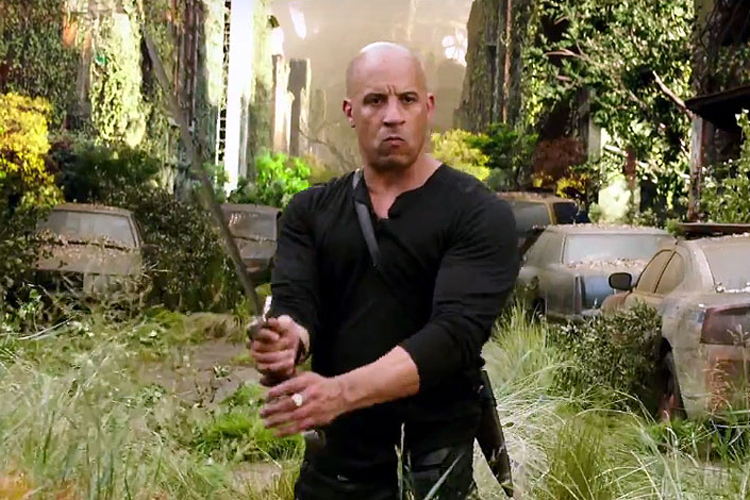 The obviousness of The Last Witch Hunter’s potential doesn’t change the fact that the film doesn’t even approach it. The dialogue is ham-handed, the blocking is boring, the film skips opportunities for dramatic reveals and other interesting shots, the action is impossible to follow — the plot is streamlined and pleasant, but scene-to-scene, it’s a mess. And it’s sad to see. Leopold Knopp is a formerly professional film critic, licensed massage therapist and journalism student at the University of North Texas. Another day, another school shooting. I’ve had a change of heart about reader input. It is now welcomed and encouraged. Like Reel Entropy on Facebook, follow it on Twitter @reelentropy, and shoot questions to reelentropy@gmail.com. This entry was posted in Entropy and tagged #breck eisner, #elijah wood, #fellowship of the ring, #game of thrones, #lord of the rings, #michael caine, #rose leslie, #sahara, #summit entertainment, #the axe and cross, #the crazies, #the last witch hunter, #vin diesel. Bookmark the permalink.